Mowing the grass is a straightforward process. If you see the grass blades already long, your inner instinct will dictate it is time to mow. However, it is a different case when the grass is new. Mowing too early can cause widespread death. That is why it is important to know when to mow new grass so that you will not hurt their normal growth and establishment of soil system. What it Takes for the Grass to Grow? Before knowing when to mow new grass, it is important to first understand several things about new grass such as their growth requirements, germination rate and ideal grass height. Knowing these things will help you understand the right timing for mowing. According to The Garden Counselor, grass seed germination will keep you in suspense. You only get one chance, but you have to wait weeks to see if you did it right. Also, grass seeds need the right combination of moisture, warm soil, oxygen and light for better germination. Aside from those mentioned above, fertilizing is also essential for the healthy growth of your grass. A newly established lawn requires a different kind of fertilizer than mature lawns. If you are buying fertilizer instead of using organic fertilizer, choose fertilizers labeled as “lawn starter.” These are fertilizers that contain more nitrogen and phosphorous that your new lawn needs. When you sow grass seeds, don’t expect for all the grass seeds to germinate. The seed package will give you important information about germination rate. Depending on the grass variety, the germination rate is normally between 80% and 90%. After a few weeks of planting, you will start to see lush blades starting to grow. They will initially appear sparse. But this is normal. Many people are tempted to mow their grass at this stage. But this is not yet the right time. Most types of grass mature between 30 and 60 days. If you cut the grass too soon, they can’t firmly establish their roots on the soil and this will ultimately cause the grass to die. Grass height is directly related to the root system. If you want to keep the roots healthy and deep, you’ll have to keep the grass at the right height. Since the roots will anchor the grass into place, mowing too early may not only cause potential death to the grass but it could also rip new growth that is just starting to sprout. Identifying the right time when to mow new grass can be a challenge. Your decision can also impact the overall health of the grass. The height of the new grass is a good determining factor when it is ready to mow for the first time or not. Generally, once the grass reaches a height of at least 3 ½ inches, it is ready for mowing. Depending on the grass type, it could take around 8 weeks to reach this height. When using a mower to cut grass, it will produce a lot of compaction. That is why you need to let the grass grow at an ideal height before cutting so that its roots will gain age and strength. If the grass is still very low on the ground, the mower will pull the seedlings out of the ground instead of cutting them. And because lawn mowers simultaneously compact the soil, it will become difficult for the young grass that have been pulled to put down their roots back to the soil. Don’t mow the lawn when the ground is wet. Wet grass can be slippery and mowing can result to accidents. It also tends to bend over so it can be difficult to get a clean cut. Not only that, wet grass can also clump in the mower, resulting to fallout in clumps rather than for the cut grass to be evenly dispersed. Many gardeners would agree that the best time to mow is mid-morning as it gives the grass time to recover before night time. 1. Be sure to use a sharp blade. 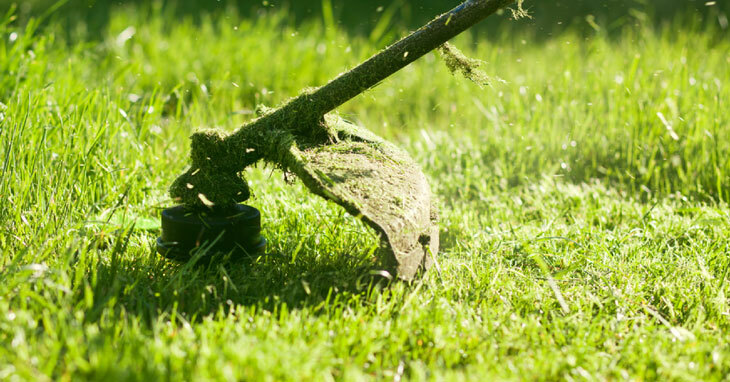 A dull blade will rip healthy lawns up to the roots and discourage new growth. As a rule, you should sharpen your blade after every 20 hours of work. If you don’t have a tool for sharpening your mower, most hardware stores can do it for you. 2. Follow the 1/3 rule in mowing. This will encourage a thick and lush lawn. The best thing about this rule is that you will not have to mow as often. 3. Try to leave behind grass clipping as long as they are evenly distributed and not clumping. Doing this will return the nutrients to the soil. It will also help retain moisture. Having a nice-looking lawn can greatly improve the aesthetics of your home. However, before you get there, it could take a lot of time and effort from grass seed planting to mowing and doing regular maintenance. Mowing is one of the most important maintenance tasks that can greatly affect the health of your grass. If you mow too early, the grass may die and new growths will be disrupted. 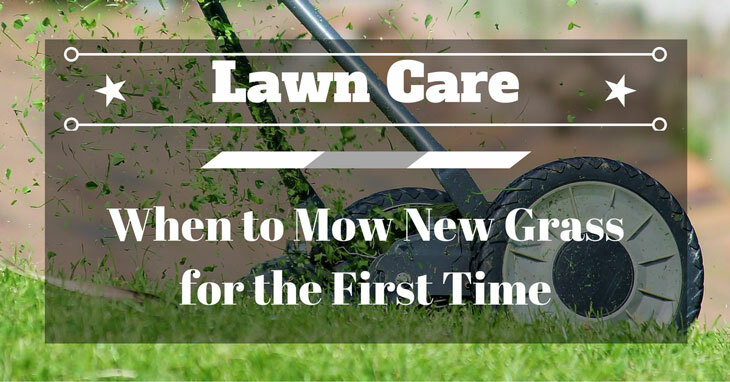 If you mow at the right time, you’ll get lush and healthy grass. Our guide above should help you identify when it is time to mow your grass and not. Did you find this article helpful? If you do, don’t forget to share it with your friends. We also have a comment section below where you could share your thoughts concerning mowing new grass.